The west side of Glacier National Park is eerily quiet, choking on wildfire smoke along with much of the West. 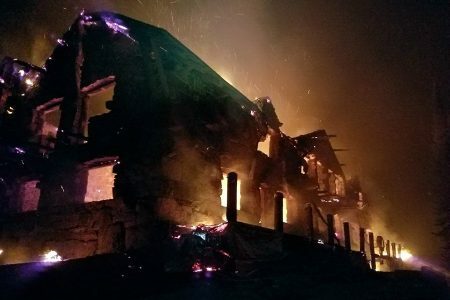 Dozens of homes and our beloved Sperry Chalet have burned locally. Meanwhile, my niece flees Hurricane Irma in Florida and my cousin is trying to salvage his flooded Houston home. Flash drought, record-shattering downpours, plenty of misery across the globe. What’s happening out there? As many climate scientists are quick to point out, you can’t say that any of this weird, extreme weather is caused by anthropogenic climate change. We can say that for four years in a row, the hottest global temperatures ever recorded have heated the oceans and increased evaporation, which supercharged this year’s hurricanes. We can say that yet another hot, dry summer in Montana, long predicted by climate models, created the conditions for prairie, farmland, 15-year-old clearcuts, and mature forests to torch across the state. Perhaps it’s just sheer coincidence that 2014-2017 are the four hottest years ever recorded. But let’s be straight – it’s probably not random. While annual global temperatures fluctuate year to year, the heating trend is clear, as illustrated by this graph published this year by NASA. 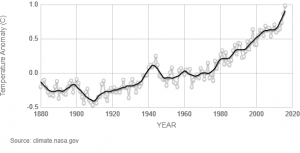 Average annual temperatures in Glacier National Park increased 2.4 °F since 1900. Fire seasons are 2-4 weeks longer. And that’s just the beginning. Unless humankind rapidly reduces our emission of carbon pollution, western Montana will see another 7 °F increase this century. That’s downright scary, but it’s a choice that’s still ours to make. Our national leaders continue to dither or deny, but there are many reasons for hope. Young people, in particular, are stepping up to protect their future. In Ashland, Oregon this week, dozens of high school students convinced the City Council to approve a citizen committee’s climate action plan to reduce pollution and improve community resiliency. In Whitefish, two high school students prepared a solution-oriented video suggesting how BNSF Railway could save money if they use current technologies to reduce locomotive idling. Another local teenager, Annika Gordon, this week is riding her bike to raise money for local climate solutions in partnership with Climate Smart Glacier Country and Climate Ride. Too many Americans have the mistaken impression that physics is political. They reject as a hoax the notion that climate change is caused by increasing atmospheric levels of heat-trapping carbon dioxide and methane. This false sense of political gamesmanship contributes to a spiral of silence in which most Americans are concerned about climate change but few dare to discuss it with friends and family. The premise of Climate Smart Glacier Country is that many Flathead County residents are ready to have mature, adult conversations about this serious issue. We believe the best way to do this is by focusing on local solutions. We can conserve energy AND save money. We believe that clear-eyed understanding of climate trends and projections will help us build resilient communities. Please get involved and be part of the solution! Join one of our six working groups. 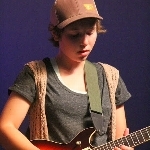 Support Annika’s Climate Ride. Or donate directly to Climate Smart Glacier Country, where your donation will be doubled by the Cinnabar Foundation, Montana’s Conservation Fund. I hope to see you back under the Big, Blue Sky … once the rains finally come and the smoke is gone.